If there's any game to which this philosophy applies, it's EarthBound. That said, not everyone digs the soundtrack's funkiness. Or the game, for that matter. This list is very solid. It's lame that Street Fighter didn't make it to the top 10, though the OSTs that made it definitely deserve to be mentioned. I really like Street Fighter's tracks, but one is just so good that it just stands out for me as one of the most memorable things about the games. And that's Guile's Theme. Not because of that meme thing, but because, back in the day, it was such a catchy tune that I would only notice that I was singing along with it when the fight was over. Remarkable. @TriforceBun Oh I'm sure I'd dig the game. IF THERE WERE ANY WAY TO PLAY IT LEGALLY WITHOUT SELLING A KIDNEY. @Zero I think it's illegal to sell a kidney. Great, blocked at every level. Mostly because I'm lazy. I mean, I don't want to play it on PC, I want to play it on my TV. And I know I could probably easily get it on Wii homebrew or something but I just keep holding out hoping it comes over legally. Also there is something about paying for something that makes me feel more... connected to it? Yeah I get that feeling... though mostly because I'd prefer to play it on a TV and have it be identical to the original (some roms have weird sound issues that really annoys me). The Earthbound guy has been teasing us lately about a republication. So you might not be as out-of-luck as you think. Not that we know what console (VC or DS), when, how, exactly which games out of the series, or anything. I think it came up back in December. Yeah but he never said anything about bringing it to the West. I'm betting it will be a Japan-only thing. I think I get metal mixed up with rock, they seem similar enough that I don't really know the difference, and both were prominent in the 90s and there's very little of it that stands out to me. As a game, I like Donkey Kong Country 3 better than the first one, however there are only a couple of music tracks from it that I felt were exceptional. DKC2 remains the best of both though. You're speaking my language, friend. Many of my top SNES soundtracks are listed, so this top ten pleases me - especially in seeing the surprise listing of Secret of Mana. It's one of the best games on the SNES, and one that featured an amazing soundtrack. The others that I wholeheartedly agree with would be: Yoshi’s Island: Super Mario World 2, The Legend of Zelda: A Link to the Past, Chrono Trigger, Secret of Mana, Donkey Kong Country 2: Diddy's Kong Quest, and Super Metroid. And while I like Mega Man X a great deal, and consider it to be one my favorite SNES games, I definitely wouldn't have it in my top ten where soundtracks are concerned. EarthBound would make my list, along with the others I noted agreeing upon, and probably Super Castlevania IV and Super Mario World as well. And though it might sound crazy, I'd (maybe) even add Mario Paint to my top ten! I still haven't had a chance to gather my thoughts on this topic, there's just so much to consider. So let me just say real quick you made some excellent picks Zero! and I love the responses in this thread so far. @Zero Yeah, it needs the context of the game to really be enjoyed. The few EarthBound songs I'd heard prior to playing the game didn't do anything for me. @Pokefreak911 If you use the SNES9x emulator in Homebrew, you can play it on a Wii. I don't like homebrew and I have the cartridge anyway. 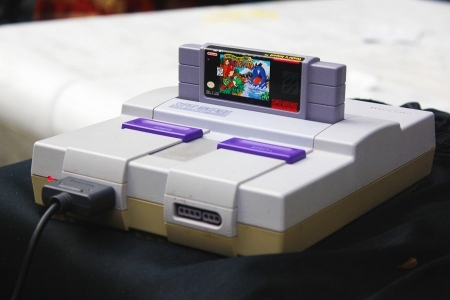 SNES all the way. Heck yeah! Street Fighter II had one of the best, and most memorable soundtracks, IMO. The arcade cabinet versions always had the best audio IMO, but the home console versions weren't too shabby. Great stuff. Crazy suggestion, Zero--why not just buy EarthBound? I know, I know. There're a finite number of carts and it's crazy expensive. ...But that's why you can buy it! Just invest a little money, play through the game, then resell it to basically make (nearly? more than?) all your money back. Or if you enjoy it enough, hang onto it.